1860-09-10 NRC operates special train for His Royal Highness, Albert, Prince of Wales Walker-1953, p. 8 . The time table for this train indicates a station of this name at what would be Mile 4.9. 1866c N.Ry. of Can. constructs 13½'×36'×12' wood frame station and dwelling with shingle roof on stone foundation with 2'×19'×12' brick addition shingle roof on stone foundation GTR.ND.1907, p. 152 This is clearly at odds with drawing NAC/NMC 96630, which is dated July 13, 1861 and a woodcut of the station appearing in Canadian Illustrated News from July 1863 Derek Boles—correspondence ..
1874-07-04 A southbound wood train rear ends a passenger train south of station. Conductor Robert Hughes and Engineer William Marlow of the wood train are charged with contravening NRC rules The Daily Globe (Toronto), Friday, July 6, 1874, p. 4; The Daily Globe (Toronto), Friday, July 10, 1874, p. 1 .
n.d. N.Ry. of Can. or G.T.Ry. constructs station addition: stone foundation Brick, shingle roof GTR.ND.1907, p. 152 . 1880c G.T.Ry. constructs station addition: 19'×22'×8', wood frame, shingle roof GTR.ND.1907, p. 152 . 1895-06-22 Northbound G.T.Ry. train collides with handcar stolen by tramps from Downsview The Evening Star (Toronto), Monday, June 24, 1931, p. 1, c. 8 . 1931-04-28 The Toronto Daily Star reports C.N.Rys. 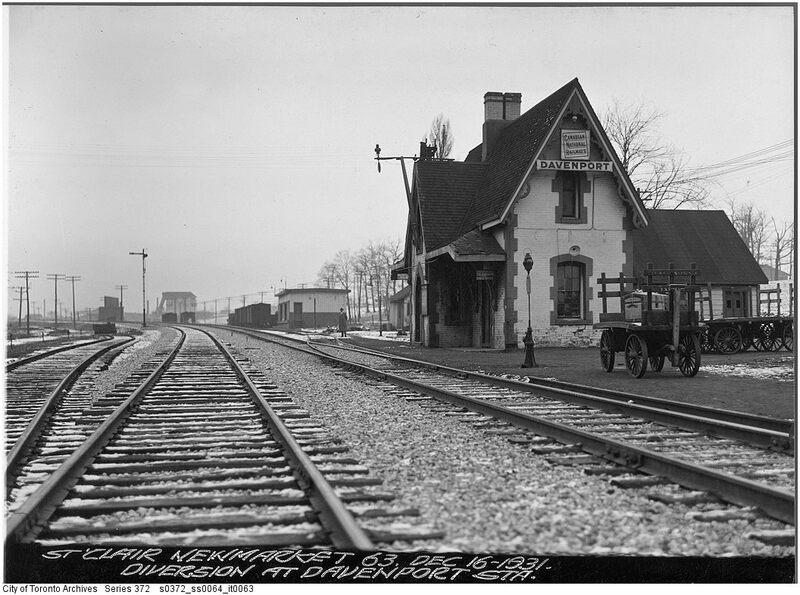 is contemplating construction of a new $60,000 station north of St. Clair to replace the Davenport station The Toronto Daily Star, Tuesday, April 28, 1931, p. 1, c. 5 . 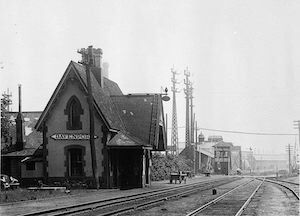 TRL Canadian Historical Picture Collection/J. Ross Robertson Collection, Acc. 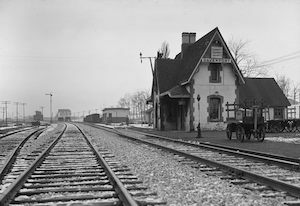 JRR 862 NRC Station. City of Toronto Archives, Salmon Acc. 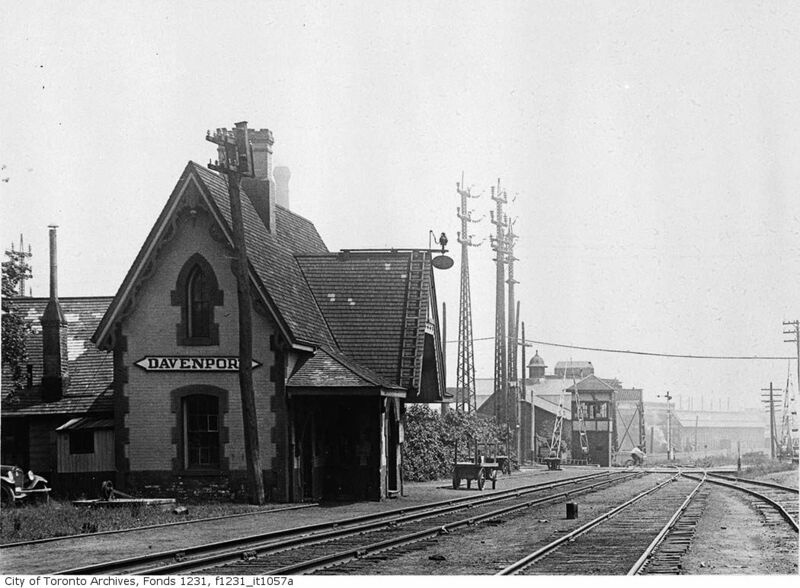 1057A Davenport station from the north; tower in background governs Toronto Transportation Commission (later Toronto Transit Commission) crossing of C.N.Rys..
OA 3868 Davenport depot in the early C.N.Rys. era. 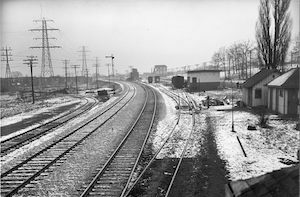 City of Toronto Archives, Fonds 200, Series 372, Subseries 64, Item 64 Looking north towards C.N.Rys. 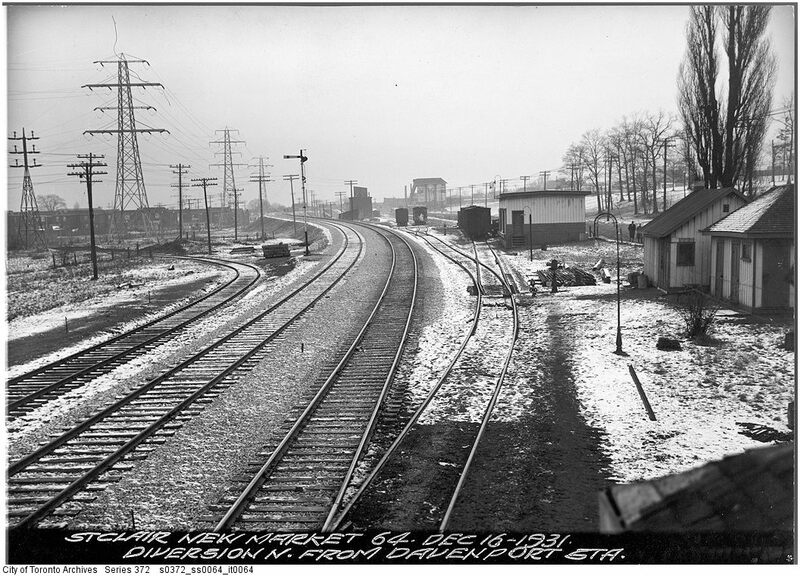 Davenport station after construction of the St. Clair Ave subway. The tool house/handcar shed and freight shed are appear north of the depot on the east side of the tracks. The Milnes Coal Co. silos at St. Clair Ave are visible on the horizon. n.d. NAC / 96631 NRC Tank house. Front and side elevations. Plans. Sections. 1861-07-13 NAC/NMC 96630 NRC Station. Plan. Elevations. Section. 1888 NAC / Col. RG30M Acc. 81293/55 Item 253 G.T.Ry. Track plan. Proposed sidings. 1888-12-03 NAC/NMC 96629 G.T.Ry. Freight house. Plan. Elevation. Section.